During the summer, it is important to take the extra steps to care for your wig or hairpiece. 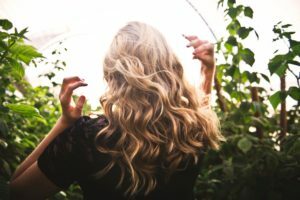 Here are some tips on keeping your locks looking and feeling healthy during the hot, humid, and sunny season! The sun UV rays can take a toll on your hair during the summer season. Using a UV protectant spray before stepping outside can protect your hair from drying out as well as prevent your color from fading. Restore Instant Protection Spray by Living Proof offers 24 hour UV protection, 450 degree heat protection, and also puts a shine on your locks. In the warmer season, you may notice your wig or hairpiece is feeling dry and in need of nourishment. To help soften the texture without having to re-wash your wig or hairpiece, you can try a dry conditioning spray, such as Soft Dry by Oribe or Instant De-Frizzer by Living Proof. These products will leave your locks soft to touch with a silky shine without weighing down or leaving a residue on the hair. *It is important to remember not to apply any type of conditioner or mask treatment on a wig or hairpiece for a long period of time. If so, you may experience irreversible tangling. Running conditioner through the hair after a shampoo followed by an immediate rinse is the best way to avoid any damage. Give your locks a break from heat styling and try a more natural, beach-wave style. After washing your wig or hair piece, towel dry the hair and scrunch the hair using your fingers for an effortless beach wave look. Let it air dry or use a diffuser to speed up the drying time. To add a bit of texture and touchable- hold, use Apres Beach by Oribe as a finishing spray. When you are not wearing your wig or hairpiece in the summer, it is important to remember to not place it near a window that has sunlight coming through. The summer sun remits stronger UV rays than any other time of year, which can result in color fading faster than ever. Keep your wig or piece stored away in an area that does not have direct sunlight on it, such as a shelf in a closet. For the latest tips, tricks, and updates from our hair replacement department, visit our blog every other week for new articles!